I know it's not yet Christmas, hehehe. But I am posting this giveaway, as this has been long overdue. and I promised to give a pattern for this set. I apologize for it took me so long to do this. Print in A4 paper with no scaling. To check, length of the biggest felt is about 5 3/4 inches long. You can amend the color, or do whatever you want. I wish to see your version. So if you made a set, please put a link of your photo on the comment box below. Again THANK YOU to that somebody who made the original felt nativity. You inspired me to do this. I really can't find who made this. I just saw it on Flickr. Guys, my guide for the Jesus, Mary and Joseph is mirrored...Sorry about that! Thank you so much! I will post pictures when I make this. It won't be for awhile, though. Thank you, thank you, thank you! How did you do the stitching for the borders? They are very special and beautifull! Thank you! This is amazing! Love it :) Pinning now, thanks for sharing! Thank you for sharing this pattern,this is my version. Merry Christmas! Oh, this is so beautiful. I am truly inspired. 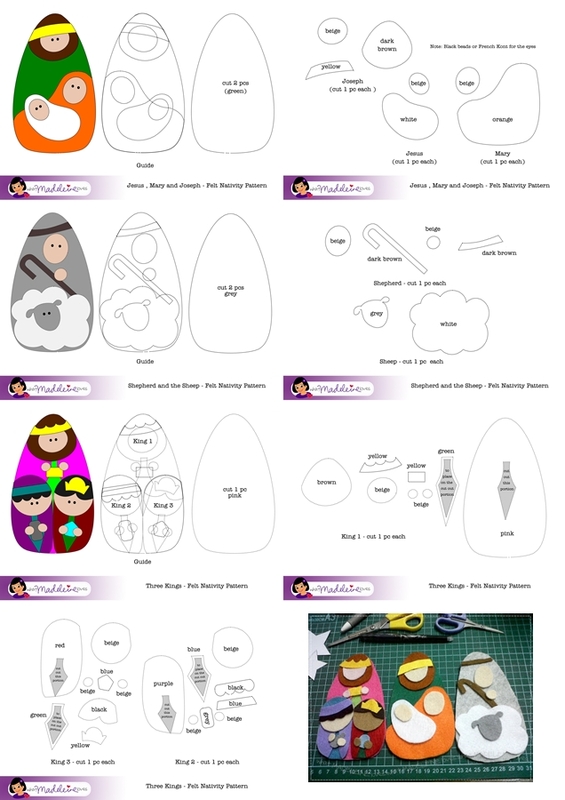 Thank you so much for sharing your pattern for this wonderful felt nativity - I hope to make it for Christmas 2015 - and if I do then I will share a photo with you. I am very grateful to have this pattern, thank you for sharing beautiful patern. Thanks for sharing.... as soon as I do my set, I'll post it here.... It'll be placed in our entry door.... thanks again for posting! And a hug from Brazil! Gorgeous. I just found these on Pinterest. Thank you so much. I'm going to make several of these for Christmas 2016. Thank you, and Merry Christmas . . . every day!